Heart disease is a serious health issue for women, yet most women do not believe it is a dangerous threat. Older women who have poor heart health are at a higher risk of strokes and heart attacks. Here are some steps elderly women can take to boost their heart health. 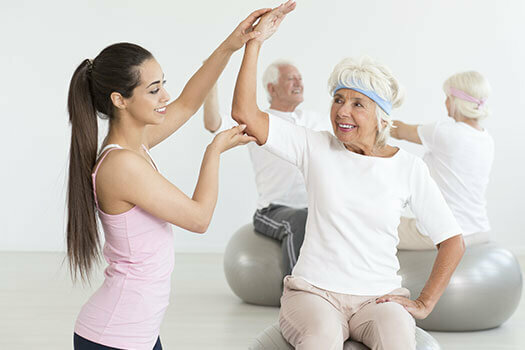 If your loved one requires help maintaining a regular exercise routine, consider hiring a professional caregiver. In Oshkosh, Wisconsin, caregiver agencies can be a great boon to seniors. With the help of the caregivers at Home Care Assistance, your aging loved one can lead a happier and healthier life. We offer a revolutionary program called the Balanced Care Method, which encourages seniors to eat nutritious foods, exercise and socialize regularly, and focus on other lifestyle factors that increase life expectancy. Cholesterol-filled plaque affects more women than men, increasing their risk of heart attacks. In women, the plaque is more likely to erode in the vessel wall instead of bursting, which leads to smaller, non-fatal heart attacks. Smoking puts women at a higher risk of developing cholesterol-filled plaque buildup. Poor eating and exercising habits can also increase the odds of blood clots. To prevent plaque buildup and blood clots, senior women need to stop smoking, eat healthy, exercise, and check their blood pressure and cholesterol levels regularly. There are medical devices they can use to ensure their blood pressure and cholesterol remain at healthy levels. If not, they need to seek medical attention immediately to protect their heart health. Instead of cooking with salt, senior women need to use herbs and spices when preparing their meals. The more sodium they consume, the higher their blood pressure will be. As a result, more strain is placed on the heart and arteries. Most herbs and spices are full of antioxidants that fight the free radicals that damage heart cells. Being around other people can reduce the risk of boredom and loneliness for senior women. Instead of being sad and depressed, they can be happy and laugh more. Laughter is one of the easiest ways to keep the heart healthy. When seniors laugh, their blood flow increases and their blood pressure rises. However, feelings of sadness and anxiety can cause their blood pressure to drop to unhealthy levels. Participating in social activities allows positive endorphins to be released throughout the body, which can boost physical, mental, and emotional wellbeing. If your loved one needs help maintaining a healthy lifestyle, consider hiring a professional caregiver. In Oshkosh, home care providers can benefit aging adults in a variety of ways. From cooking nutritious meals to offering timely medication reminders, the dedicated caregivers at Home Care Assistance are available to help your elderly loved one 24 hours a day, 7 days a week. To create a comprehensive in-home care plan for your elderly loved one, call one of our professional Care Managers at (920) 710-2273 today.